Fender Riser 2014+ DL1000 - AdventureTech, LLC. The fender raising kit can be installed with the wheel on or off. You will need a 10 mm open end wrench and a five mm allen wrench. Both are contained in the bike's tool kit. The kit includes six 16 mm long bolts and two 25 mm long bolts. Note using a temporary thread lock (e.g., Blue Locktite) is a good practice for this kit. 1. Remove the bolts supporting the fender. This includes the stud with the reflector and the mushroom head bolts above it in the front and at the rear. 2. 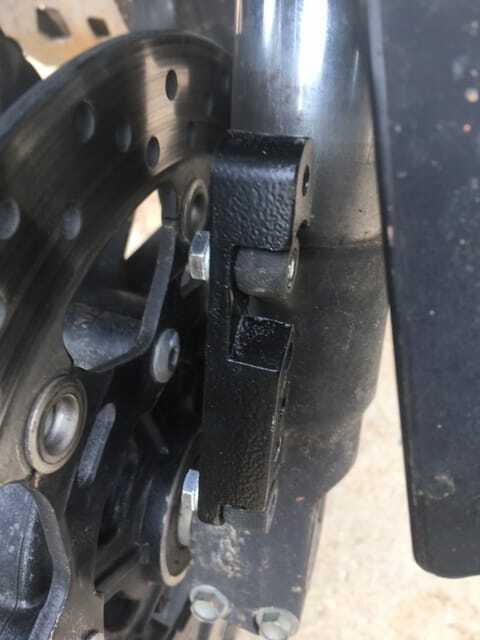 Place longer piece from the kit against the fender bolt supports as shown in the picture. 3. Insert the 16 mm long flangehead bolts from the back side and tighten with a 10 mm wrench. 5. Install reflector stud and mushroom bolts through the front fender into the new higher holes in the long riser. Leave the front bolts slightly loose until the back of the fender is bolted on. The flat side of the rear riser faces out and the thick end goes on the bottom. The upper hole is thread. 1. Place a 16 mm long flangehead bolt through the back of the fender. Insert the top of the riser into the fender from the outside and tighten the flangehead screw. Leave slightly loose. 2. Insert one of the 25 mm bolts into the thicker part of the rear riser and screw it into the stock rear mounting point. Tighten all bolts. It is not necessary to heavily torque the bolts. 10 pounf-ft (hand tight) is sufficient.